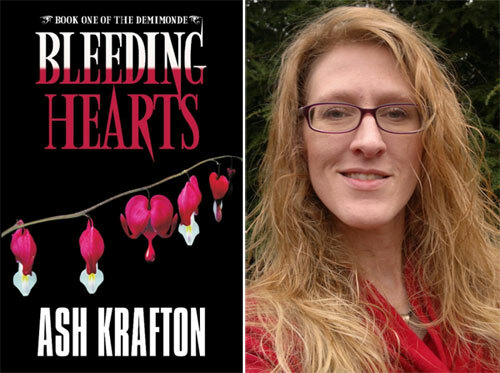 Today we're talking with our own Ash Krafton about her journey with getting her debut novel, Bleeding Hearts! Read on to learn more about approaching publishers directly, being a great social networker, and researching Egyptian mythology! Though your first novel, Bleeding Hearts: Book One of the Demimonde is being published this month by Pink Narcissus Press, you’ve also written a lot of short stories and poetry (and won a lot of awards for them)! How did you start writing? I began writing as a form of cheap therapy (*grin*). I have a high-pressure medical job that was becoming increasingly stressful…so I did the sane thing and retreated inwardly. I've always had a literary soul (my mom has a stack of my writing from when I was in school.) Going back to writing was a natural thing and it really helped me to focus and enjoy my time off. I ended up writing passages and scenes from a fantasy that eventually became a novel-in-progress. But it wasn't serious. It was, like I said, cheap therapy. Then I got the idea for Bleeding Hearts—and the whole game changed. I was serious about this project and, with the support of my family, I worked on that project until it was a candidate for publication. The "short stuff" as I call it, is the result of a mishmash of things—some of it I wrote to combat writer's block, other things I wrote to express ideas that didn't fit into my novel writing. I also began to explore traditional forms of poetry—sestinas, villanelles, ghazals—because the mixture of meter and cadence and line count and rhyme is a decidedly scientific thing. It helps keep my left brain happy. That the short stuff has ever been worthy of recognition still blows my mind. Did you have an agent or go directly to a publisher? If the latter –writers are often curious about books that were sold directly to a publisher, without the help of an agent go-between. How did you decide to submit directly, rather than using an agent? How did you find publishers to submit to? I queried Bleeding Hearts and eventually signed with an agent. However, our work together didn't result in a fairy tale ending. There were a lot of challenges and, after about nine months, we ended our contract. My QueryTracker friends were very supportive and helped me to find my way through the fog. (Hug, ladies, and my unending gratitude!) I decided to tread water for a while and went back to entering novel-writing contests. I couldn't let my project die just because of a failed agent episode. Then I learned about the small press market. Up until then, I only used Duotrope to find poetry and short fiction markets for my work. However, the site has a growing database of small presses looking for novel and novella-length work. I went back to querying—and, by this time, I was a pro—and started knocking on the doors of the little houses. My world completely opened up. The contests I entered started announcing results—and in a short period of time I found out I'd made finals in several RWA contests. That is BIG TIME publicity for a writer. I was absolutely floating on air…then I got the first offer of publication. At the time I got the first offer, I had about a dozen queries out to other small presses. Some had already asked for a partial or a full, others I hadn't heard back from at all. I sent everyone an email with the subject "Offer on the Table for Bleeding Hearts" and explained I had an offer and wanted to know if they'd had a chance to read my submission or if they were interested in making an offer. I got three non-responses, one "best wishes, we're backlogged and can't get to your sub and don't want to hold you up," and five more offers. You do an amazing job of networking and building buzz for your work. What were some of the things you did to make people aware of Bleeding Hearts? If you were going to give other writers one tip for building buzz, what would it be? Self-promotion is a scary thing for writers but you have to approach this thing as a business. A network is essential. How many readers are there in the world that might like your book? Do you honestly think you can reach them all on your own? Social media is the Technology God's gift to authors. We can send our messages out to our peers, who may repeat the information to THEIR peers, and so on. Promotion is a pass-it-on deal. Be confident, reach out, and let the world know you have a message worth sharing. As for me, I'm just a grown-up kid who loves playing with her computer. I got my first real PC and Internet service in '93 when I was in college. I remember how angry my mom used to get because she'd try to call and get a busy signal because I was on-line. So, for a nerd like me, this isn't really work. Networking was tough in the beginning because I was shy and had no confidence and knew nothing about publishing. However, with time and a lot of reading and fooling around at Query Tracker's forum, I learned the ropes, made writer friends, and decided it was time to do what everyone else was already doing: building my social network. My husband accuses me of fooling around on-line. When will he learn that I'm really *working*? Anyone else interested in *working* with me? I'm on Facebook, Twitter, and Goodreads. I also blog at http://ash-krafton.blogspot.com and call http://ashkrafton.com home. In Bleeding Hearts, you focus on the Egyptian god Horus. What kinds of research did you do? Studies of Egyptology have been my hobby as far back as I can remember. I love museums and my family indulges me by accompanying me to every exhibit we find. I got to see the huge King Tut exhibit that came through the Franklin Institute a few years ago (although my son drew the line at the Mummy exhibit. Chicken. Scooby Doo ruined my kid on mummies forever.). I also own a lovely translation of the Book of the Dead. Although I didn't have it for the writing of this book (I used what I could find on-line) I have found some amazing stuff that is inspiring passages for the sequels, which are in-progress. I'm not an expert. I'm just someone who loves the study of Ancient Egypt and that love somehow found its way into my story. Tell us a little bit about Bleeding Hearts and how we can get it! Saving the world one damned person at a time—shy advice columnist-turned-oracle must find a way to save her dangerous demivampire lover from the fate that threatens each of his race: evolution and the destruction of his soul. This was a really interesting and informative interview. I enjoyed reading it. Wonderful, Ash! Always glad to share others' success--persistence pays!